I always loved my mom’s homemade pasta, especially in her homemade chicken or tomato soup. 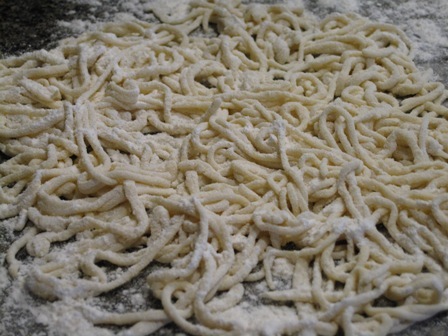 I also started to make my own pasta for my family, and they love it. 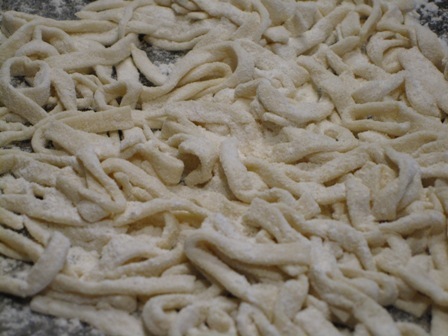 It is simple to make, and out of 2 cups of flour, you get enough pasta for a family of four. Talking about saving money and having great tasting food! 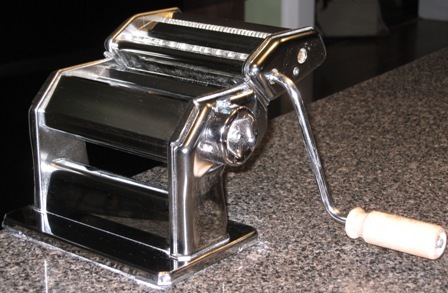 Of course I was doing it the hard way, until one day my daughter presented me with an Imperia Pasta Maker Machine, and making pasta has not been the same since. I still make pasta, but now this job is a breeze with this little gadget. It is quite simple to operate, yet produces wonderful results. I even used it for flattening the dough rounds for making homemade perogies (potato dumplings). A small motor is also available to ease the operation of this pasta maker machine, if you prefer not to use the crank, but I have not decided on that purchase yet. It is also very easy to clean, since all you do is use a small brush to brush off the remaining flour and any bits of leftover dough, and wipe it clean with a paper towel. It is not recommended to wash it with water. 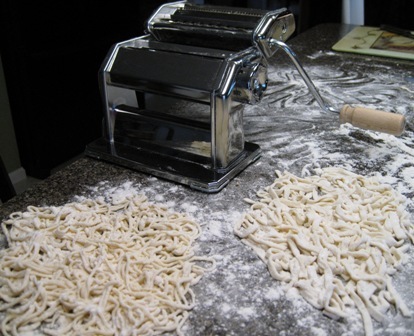 Yummy…..home made pasta. Doesn’t this make you hungry, and wanting to whip some up for tonight? If you still do not have this wonderful little gadget in your kitchen, you are long overdue for one, and must add it to your wish list. You will love it as much as I do! I know it! Your family will love your homemade pasta. Don’t you just love fresh pasta. Now you can try out different infused flavors—basil, spinach, parmessan. I have even made dessert pastas—chocolate ravioli, blueberry fettucini, and cinnamon pasta. I incorporate these items when making the dough. Wow…that sounds great! I bet my granddaughter would love it as well. Thank you for the wonderful suggestions.